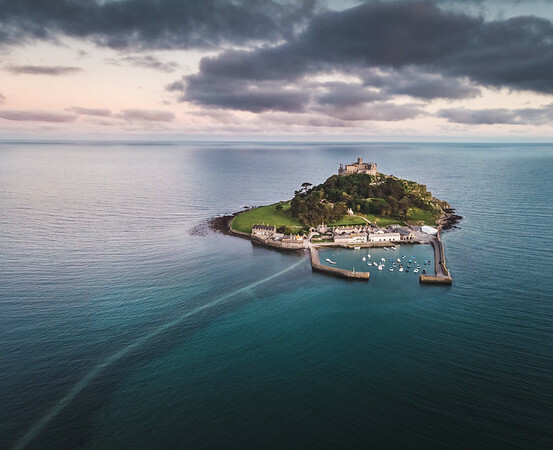 St Michael's Mount is called "Karrek Loos yn Koos" in Cornish, which literally means "the grey (hoar) rock in a wood". It represents a folk memory of a time before Mount's Bay was flooded, indicating a description of the mount set in woodland. Which could be true as Remains of trees have been seen at low tides following storms on the beach at Perranuthnoe. Evidence has been found that people lived on the Island during the Neolithic age (4000 BC to 2500 BC). Wheal Coates is a historic abandoned tin mine situated on the north coast of Cornwall, on the cliff tops between Porthtowan and St Agnes. 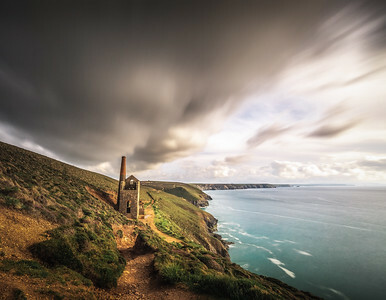 As we desencded the cliff to this building called Towanroath Shaft which used to be a Pumping Engine House, a storm appeared from the south creating this magnificent scene. I tried to align the storm clouds, which were catching the light from the setting sun, with the chimney and got a long exposure to create this picture. Experimenting with different foregrounds after the sun set at Enys Dodnan Arch. Spring brings with it amazing compositional opportunities as wild flowers fill the English countryside. I cannot resist playing with these different framing elements and you will always find me struggling to get inside a wild bush or lying flat on the ground to get that perfect foreground. This is what you get when everything falls into place. 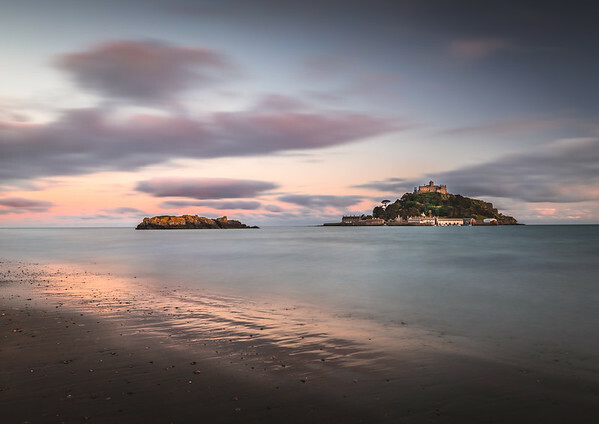 When sunset overlaps with high tide, you get this amazing scene at St Michael's Mount in Cornwall. You can see the submerged path leading to the island and the beautiful evening light in the sky. Found a crystal clear tidal pool at the beach in Crackington Haven (one of the lesser known spots in Cornwall) with absolutely no wind. Decided to use a small aperture to create a sun star of the setting sun, the reflection of the star was an added bonus. 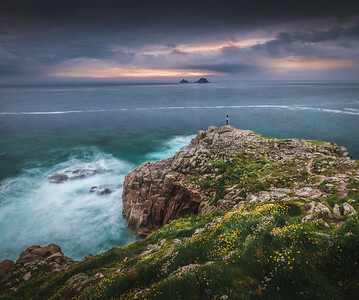 After shooting sunset at Bedruthan steps we were almost out of light but as it was our second last day in Cornwall, wanting to make the most of it, we decided to drive to Trevose Head in hopes of getting a few shots there before the sky lost all light. It was one of the most nerve-racking drives on the narrow country roads of Cornwall as we raced against time to make it there. You got to love summer for this if nothing else: you can actually shoot until sun down at a location and then drive to another 30 minutes away and still shoot with some light left in the sky. 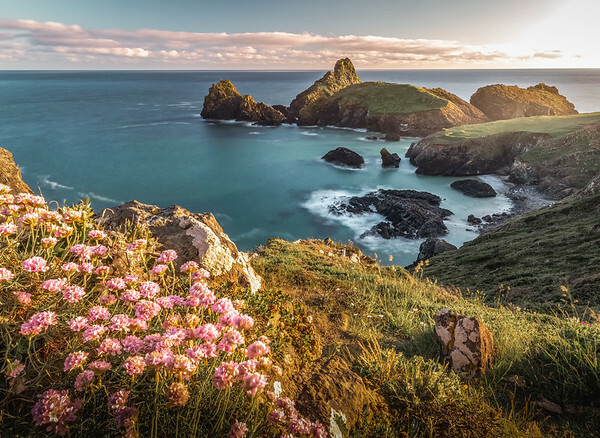 Located on the eastern side of Mount's Bay, Cornwall, Kynance Cove is one of the most beautiful stretches of coastline in the South West. 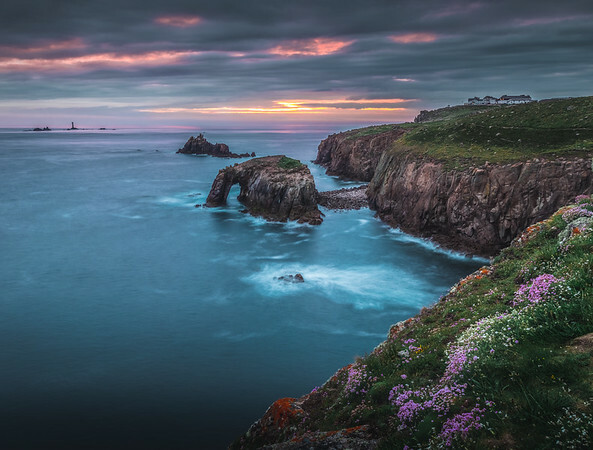 This cove is part of the Lizard peninsula which is known for its botany and geology, and about 375 million years ago the molten rock, which eventually became the Lizard, was about 10 km below the surface of the earth. Porth Nanven is on the western most coast of England with no land mass between here and Canada. On summer evenings, you can see light on the horizon for hours after the sun has set. @eyeseesurs at The Rumps. 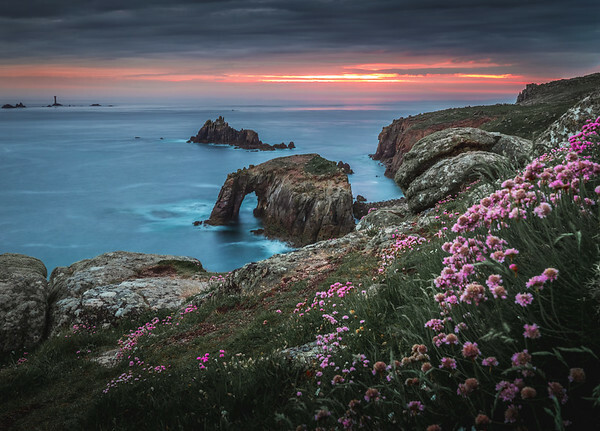 The Rumps known in Cornish as Din Pentir, meaning fort at Pentire, is a twin-headland which projects north into the Atlantic Ocean. It is the site of an Iron Age promontory fort. The twin headlands are linked to the mainland by a narrow neck making The Rumps a formidably defensive site. 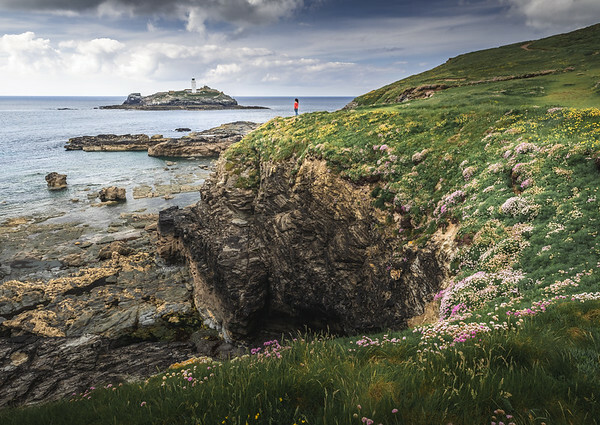 Spring is one of the best times to visit Cornwall. 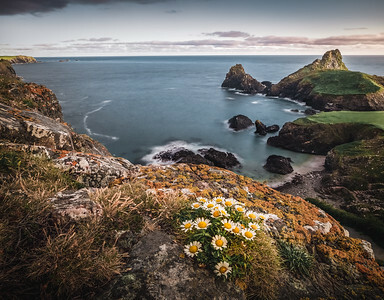 Wild flowers everywhere and those dramatic rocky coastlines can make any landscape photographer's dreams come true. I thoroughly enjoyed playing with different compositions on our spring/early summer trip there. 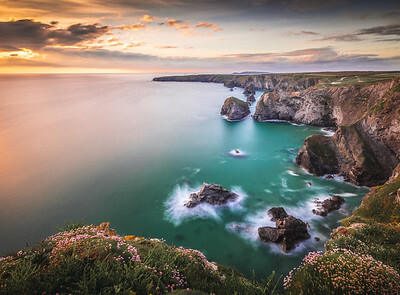 Cornwall should definitely be on every landscape photographer's bucket list. A small stream that merges into the ocean an Porth Nanven. 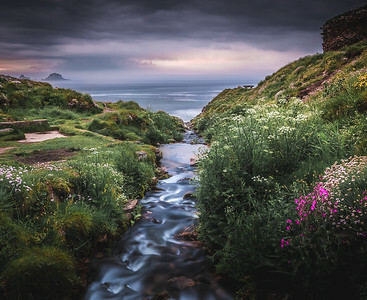 The stream was surrounded by spring wild flowers in full bloom and formed an interesting leading line into the misty Celtic Sea as light from the setting sun peeped through tiny openings in the stormy cloud cover. Truly magical. 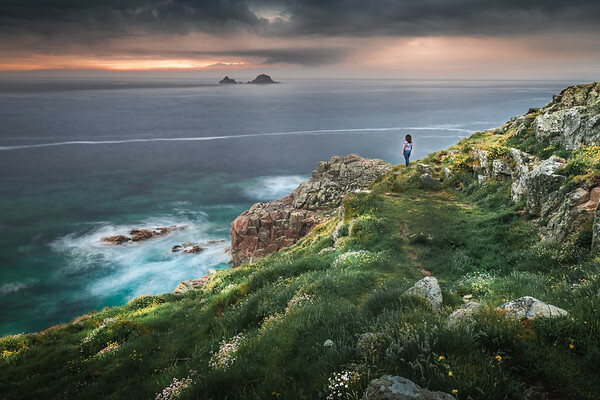 One of the most popular photography locations in Cornwall and our evening shooting spot for our second last sunset in Cornwall. I had seen pictures and videos of this location, but one has to be there to realise the sheer scale and beauty of this place. Simply Breathtaking. This was our first photography spot when we reached Cornwall. 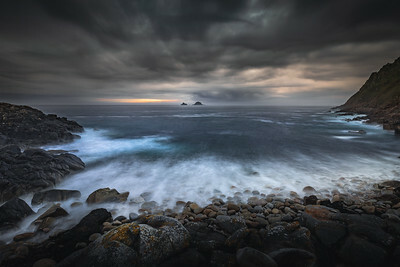 The sky was dramatic with thick storm clouds and the crashing waves were adding to the drama. Just as i setup my tripod to get a long exposure the setting sun broke through the the stormy sky just for a moment to create this stunning scene. I was lucky enough to be able to capture it. 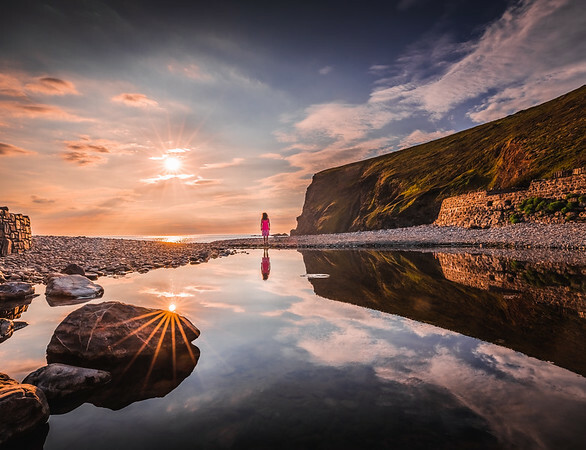 Beautiful landscape, Stunning light and no crowds - this is what a photographer's dreams are made of. 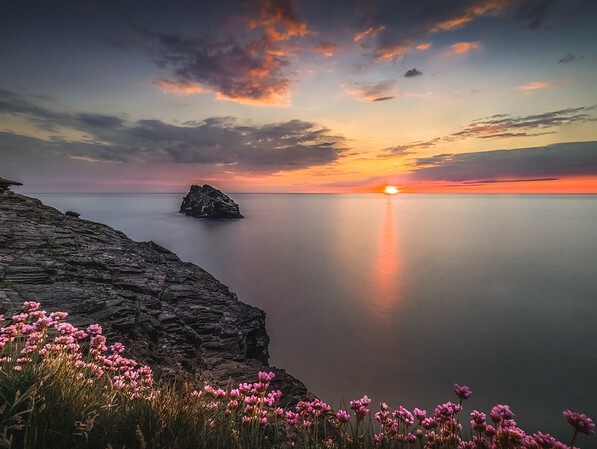 We witnessed this glorious sunset at Bedruthan Steps in Cornwall which is quite a popular area. Surprisingly, there were very few people around and i managed to get this 9 shot pano to try an capture the scale and beauty of this place. Another one from Boscastle. This sunset was so brilliant it deserves one more at least. As the sun set, the sky lit up with shades of pink and orange creating this spectacular scene for a few minutes before night fell and the landscape plunged into darkness. 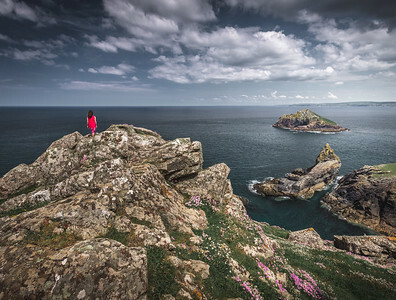 @eyeseesurs standing on the edge of England and staring into the Celtic sea. Our first stop after we reached Cornwall. After navigating some seriously narrow roads barely inches wider than the car at a few places, we reached Porth Nanven, a hidden gem on the western most coast of England. Another one from Boscastle taken during the hike up the hill. As you can see the sun had already started to set and the hike was more of a run up the hill. Managed to grab this in a hurry. 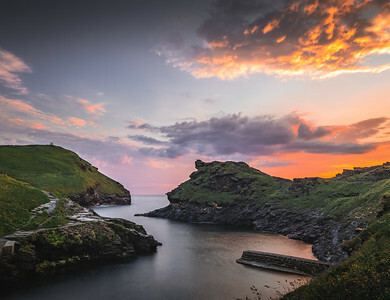 The harbour of Boscastle is a natural inlet protected by two stone harbour walls built in 1584 by Sir Richard Grenville. 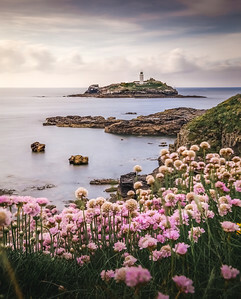 Approximately 300 metres from Godrevy Head, this lighthouse marks the Stones reef, which has been a hazard to shipping for centuries. These Stones claimed many ships, but the demand from the locals for a lighthouse were ignored until the wreck of the iron screw steamer SS Nile during a storm on 30 November 1854 killing 40 people. 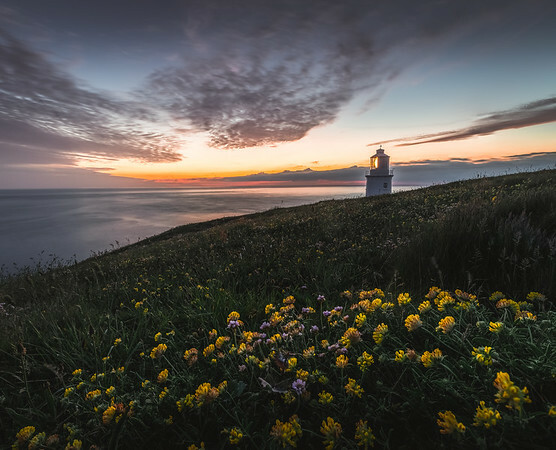 A lighthouse was finally built between 1858–1859. Focus stacked image of Kynance Cove near the Lizard point in Cornwall at sun down. Don't you just love it when the clouds part just enough to cast that warm glow on parts of the scene. I like how the flowers in the foreground and the distant peaks are catching the warm evening light while the middle ground is in shadow. This is what I call magic light! 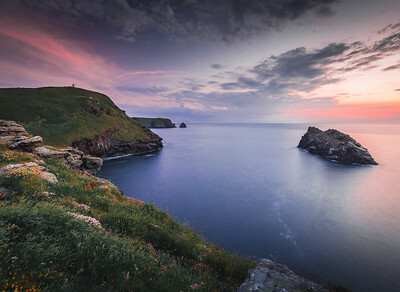 We headed to Boscastle for our last sunset in Cornwall and nature sure did put on a show. The sky was painted with all imaginable sunset colours. A short trek from the main village car park along the harbour an an easy climb rewards you with endless views of the Celtic sea. I decided to shoot into the sun keeping the wild flowers in the foreground as I liked how the were catching the light from the setting sun. Can you spot the brave canoeer? 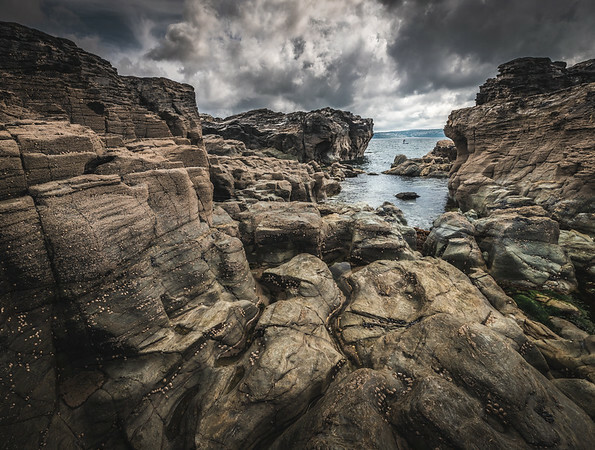 Tidal rock formations at Trevose head are some of the most unique and diverse I have seen. 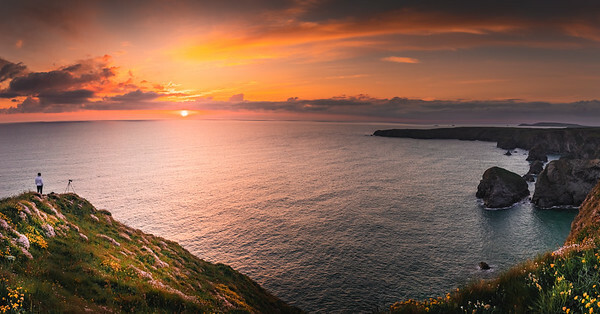 We were about to leave this spot after shooting the Trevose head lighthouse from the cliff top when we decide to go down to the beach for a stroll. And boy, we were so glad we did! End of the world! (Or at least the end of England). The building you can see on the top of the cliff is the hotel we stayed in. One of the best located hotel i have been to. The place is called Land's End as this is where England ends. There is a cafe/shop located here called the "First and Last House" as it's the first or last building depending on whether you are entering or leaving England.